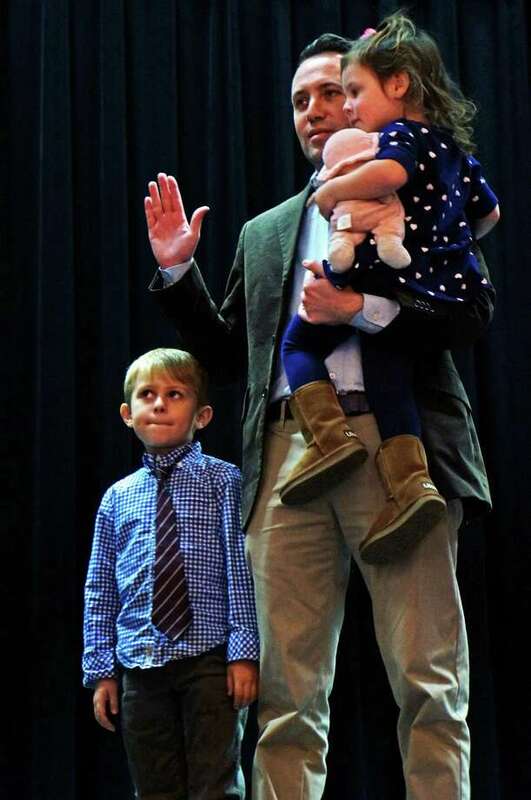 Keith Varian brought his children on stage Monday night as he took the oath of office for Representative Town Meeting District 2. Despite a bit of pomp and circumstance at Monday's swearing-in ceremony for board and commission members elected two weeks ago, that didn't stop families and friends from making sure they captured the big moment on all kinds of electronic devices. Town Clerk Betsy Browne, during the ceremony at Fairfield Warde High School, delivered the oath of office to members of the boards of Education and Finance, Town Plan and Zoning Commission, Zoning Board of Appeals, Board of Assessment Appeals, Representative Town Meeting and constables -- one of whom, Browne's father, Joseph Peddle Jr. -- got a peck on the cheek before leaving the stage. When the short formalities had concluded -- the Board of Selectmen and town clerk now serve four-year terms and were not on the Nov. 5 ballot -- First Selectman Michael Tetreau had a few words of wisdom for the officials. "This is starting everyone off here in a new term in office," Tetreau said. "It's also the closing of the campaign. From here on in, much like in the spirit of the Fairfield Public Library, you're one team for the town. We're all working together here for all our citizens." Tetreau also congratulated all those candidates who ran in the municipal election, even if they didn't win. Democrats took a bit of a beating in the race for RTM seats. What had been a 28-22 split in favor of Republicans on the legislative body, ballooned to a 34-seat majority for the GOP after the election. Many seats on other town boards, including the Board of Education and the Board of Finance, were basically pre-determined before the balloting since the political parties generally only the number of candidates guaranteed election under the town charter. Democrats retained their majority on the school board, while Republicans continued to hold sway on the Board of Finance and the TPZ.